Abdominoplasty (also known as a tummy tuck) is a surgical procedure that removes the excess fat and skin from the lower abdomen, brings the abdominal muscles back to their original position, slims the waistline, and repositions the belly button into the ideal position. The goal is to remove the fat and skin but also create a tighter and firmer abdominal profile. 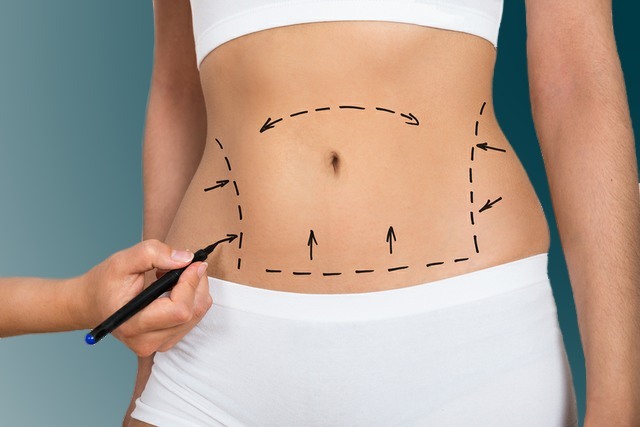 A tummy tuck is a very common surgery for both men and women, so, if you have excess fat or loose, lower abdominal skin that has been resistant to diet or exercise, abdominoplasty could be a good option for you. Abdominoplasty is an effective solution for women whose pregnancies have left them with excess skin, stretch marks and stretched out muscles. However, we do recommend that if you are still planning on having more children that you wait until after your last child before considering a tummy tuck. This procedure is, however, done for cosmetic reasons only, so if you do get pregnant after a tummy tuck, it will not be harmful to you or your baby. There are two types of tummy tucks that we can perform at Griner Plastic Surgery. This is the most common procedure that we recommend for most patients. It addresses all three layers of the abdomen: skin, fat, and muscle, and can achieve a flatter, firmer abdomen. Our techniques will also conceal the scar under most bathing suits and underwear. In a full tummy tuck, an additional incision around the belly button is required to remove the excess skin between the belly button and the pubic region. While every incision is made in a way that it will be easily concealed, Griner Plastic Surgery also offers options for scar revision and reduction if you still have some concerns. Be sure to ask Dr. Griner about these options if interested. A mini-tummy tuck is basically a more basic version of the procedure, and we recommend it for cases that involve a smaller amount of excess skin and fat in the lower abdomen or in the area just below the belly button. The scarring from a mini-tummy tuck is slightly shorter than a full tummy tuck, however the amount of sculpting and tightening that can be done is more limited. We will provide a set of pre-operative instructions that describe the steps you need to take to prepare for surgery. This will cover things like activities, foods, and medications to avoid prior to surgery. It’s important that you familiarize yourself with and follow those instructions, and we also recommend arranging for a responsible adult to take you home after the surgery and stay with you the first night if necessary. Before the surgery begins, you’ll meet one last time with Dr. Griner and the anesthesiologist prior to surgery so you can ask any last-minute questions. The actual surgery typically takes less than 3 hours, and then we’ll move you to the recovery room for a while – generally about 1 to 1½ hours – after which you’ll be discharged. We will also provide you with important post-operative instructions, so you’ll know which foods and activities to avoid during the recovery period after surgery. For example, we recommend avoiding driving for 1 to 2 weeks or while taking pain medication. You should also avoid lifting anything heavier than a gallon of milk for at least 6 weeks. However, most patients can return to work within 2 to 3 weeks after surgery, though this time frame can vary depending on your individual situation and line of work. More commonly known as a “tummy-tuck,” abdominoplasty is an operative method that primarily focuses on improving the look of the abdominal region. The procedure helps get rid of the extra fat and skin in that region and can even reduce the muscles of the abdomen to create a flatter abdominal or tummy region. How long does recovery take following a tummy tuck? Recovery time varies from case to case. In some cases, people who have undergone an abdominoplasty can usually go back to work within two to three weeks. However, we advise against returning to high-impact activities for four to six weeks after the surgery. How long does an abdominoplasty procedure take? Procedure time can vary depending on the situation. In most cases, however, a tummy tuck usually lasts between two to five hours. If I gain weight after an abdominoplasty surgery, will my results be affected? Yes. It is still possible to gain fat after abdominoplasty. If that happens, it can certainly affect your results and return the area to the appearance it had before the surgery.